37 A None No Power Seat 37 A is a standard Economy Class seat that may have limited recline due to the exit row behind. 37 B None No Power Seat 37 B is a standard Economy Class seat that may have limited recline due to the exit row behind. 37 C None No Power Seat 37 C is a standard Economy Class seat that may have limited recline due to the exit row behind. 37 J None No Power Seat 37 J is a standard Economy Class seat that may have limited recline due to the exit row behind. 37 K None No Power Seat 37 K is a standard Economy Class seat that may have limited recline due to the exit row behind. 37 L None No Power Seat 37 L is a standard Economy Class seat that may have limited recline due to the exit row behind. 38 A None No Power Seat 38 A is a standard Economy Class seat that has extra legroom due to the exit in front however, it may also have limited recline due to the exit row behind. 38 B None No Power Seat 38 B is a standard Economy Class seat that has extra legroom due to the exit in front however, it may also have limited recline due to the exit row behind. 38 C None No Power Seat 38 C is a standard Economy Class seat that has extra legroom due to the exit in front however, it may also have limited recline due to the exit row behind. 38 J None No Power Seat 38 J is a standard Economy Class seat that has extra legroom due to the exit in front however, it may also have limited recline due to the exit row behind. 38 K None No Power Seat 38 K is a standard Economy Class seat that has extra legroom due to the exit in front however, it may also have limited recline due to the exit row behind. 38 L None No Power Seat 38 L is a standard Economy Class seat that has extra legroom due to the exit in front however, it may also have limited recline due to the exit row behind. 39 A None No Power Seat 39 A is a standard Economy Class seat that has extra legroom due to the exit in front. 39 B None No Power Seat 39 B is a standard Economy Class seat that has extra legroom due to the exit in front. 39 C None No Power Seat 39 C is a standard Economy Class seat that has extra legroom due to the exit in front. 39 J None No Power Seat 39 J is a standard Economy Class seat that has extra legroom due to the exit in front. 39 K None No Power Seat 39 K is a standard Economy Class seat that has extra legroom due to the exit in front. 39 L None No Power Seat 39 L is a standard Economy Class seat that has extra legroom due to the exit in front. 55 A None No Power Seat 55 A is a standard Economy Class seat in the last row of the plane and may have limited recline. The close proximity to the lavatories may bothersome. 55 B None No Power Seat 55 B is a standard Economy Class seat in the last row of the plane and may have limited recline. The close proximity to the lavatories may bothersome. 55 C None No Power Seat 55 C is a standard Economy Class seat in the last row of the plane and may have limited recline. The close proximity to the lavatories may bothersome. 55 J None No Power Seat 55 J is a standard Economy Class seat in the last row of the plane and may have limited recline. The close proximity to the lavatories may bothersome. 55 K None No Power Seat 55 K is a standard Economy Class seat in the last row of the plane and may have limited recline. The close proximity to the lavatories may bothersome. 55 L None No Power Seat 55 L is a standard Economy Class seat in the last row of the plane and may have limited recline. The close proximity to the lavatories may bothersome. China Eastern's Airbus A320 are primarily used on short-haul routes within China. This aircraft features a two class cabin configuration with 8 Business class seats and 150 Economy seats. Decent business class seat for a 2-hour flight. Limit decline angles for all business class seat, definitly not standard business seat. My guess is the airline limit the decline angle to increase more seating for econmic seat. Seat is nice and soft, average legroom. Service is robotic, mechanical. A hot meal consisting mostly of white rice and a spoonful of canned meat/vegetable mix is served on most flights. Note that drinks come well after the meal is served. Choices are limited to water, Coke, Sprite, orange or apple drink, herbal tea, hot tea or coffee. In flight entertainment shown on overhead screens is mostly car advertisements, short video features, candid camera humor. 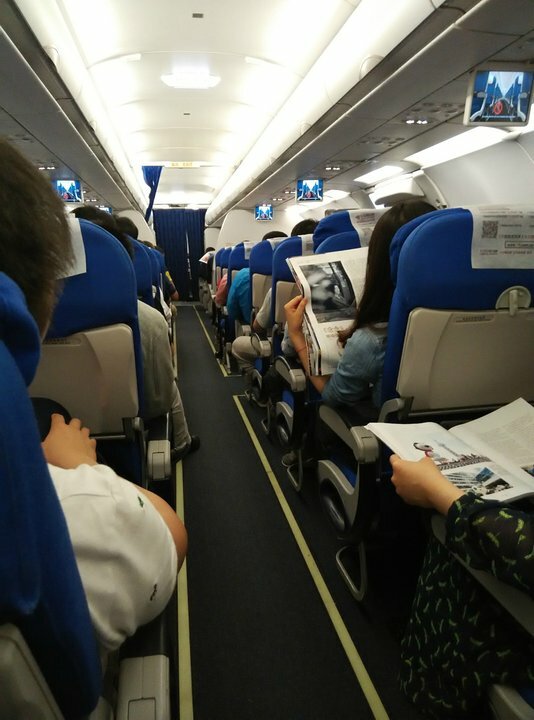 On longer flights a movie will be shown but will be cut off abruptly when preparing for landing. Audio may or may not accompany the video. 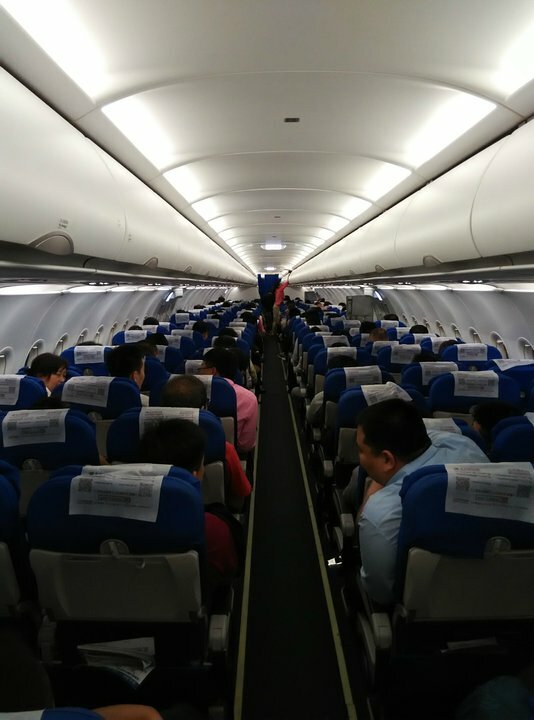 Note that on China domestic flights, cell phones are not allowed to be used at any time even in flight mode, although enforcement of this rule varies a lot. They will require you to turn off all electronics well before landing, up to 40 minutes. China Eastern flies 1 versions of Airbus A320.